JDH Mr. Gavyn Manso 142/5 combines an extremely eye appealing phenotype with a breed leading pedigree. 142/5 is a growthy, heavy boned, long, and level made bull. He is sired by the many time champion and outstanding producer JDH Expression Manso 735/4. The dam to Gavyn is one of the most consistent producers for J.D. Hudgins -Locke Division calving each year for eight straight years in the same month! 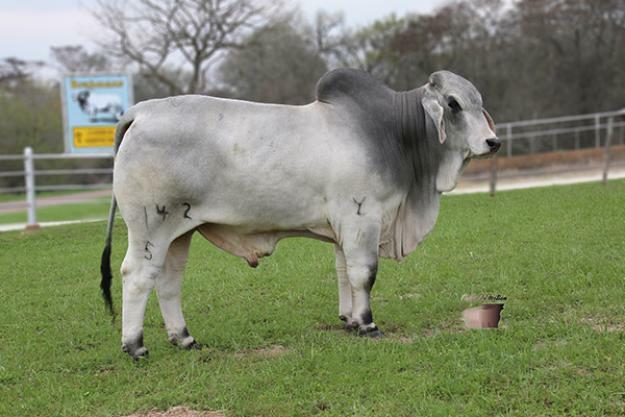 Pay close attention to the pedigree on this young sire that combines the legendary animals of the Brahman breed to include +JDH Mr. Elmo Manso , (+)JDH Liberty Manso , JDH Miss Darby Manso who has produced three major herd sires, and JDH Nieto De Manso who was sold to Brazil for $200,000. This is a great opportunity to purchase a bull that combines the key essentials of a successful sire prospect.